Everyone in the creative business hopes to leave a legacy for the future, some mark on their craft that will resonate through the ages long after the originator has died. In the case of Image Comics, part of that proud legacy is spit. As you can see, when you're a young man you have only one phlegming, because your adolescent body is just not sufficiently developed enough. But eat all your breakfast and work hard every day, and soon you'll grow into an eight foot tall Hulk/Wolverine rip-off with six, seven or even more phlegmings of your own! Notice, however that supporting that many phlegmings at once is not easy. Just look at how many new and innovative neck muscles not present in regular humans are required to generate so much viscous spittle. And the jaw control required to form it into strings instead of flinging it about as droplets results in massive growth of your teeth and gums. Practically your whole face gets devoted to supporting the creation and maintenance of phlegmings, but I think we can all agree it's well worth the effor. On a more positive note, given the size of his enormous melon, I think that young man definitely has what it takes to be a top-notch super-hero one day, supporting his own set of phlegmings and other mucous-related products. My very first comic book that I bought by myself was Pitt, and my very first comic books used Pitt as a model and reference. Pitt is an awesome idea, he has nothing to do with Wolverine or The Hulk. No need to smash underground comic writers just because of a little spit. I don’t know much about Pitt, as this is the only issue I own and I only got it a few weeks ago. I call him a Hulk/Wolverine ripoff mostly due to his look — this is a classic “Gray Hulk” build, right down to the pants with no shirt or shoes. And like most Image comics, the Wolverine component is the claws. Big, long, sharp, rending claws. Throw in the Spawn-like chains and this character looks (at least at first blush) very derivative. I think Image very much IS comics to a certain generation, which started right after I stopped collecting comics. They were very much about violence, non-stop action, “cool” dialog in combat, and that incredibly exaggerated Liefeld style of anatomy and illustration. I hated it when it was coming out, and I find that I still hate it years later. But that’s a personal preference. Like any art, you have to judge for yourself if it’s something you like or not. I don’t think less of people who like Image comics from the early 90’s, but it also doesn’t make me think more of the work itself. I’m willing to listen if you want to make the case that Pitt was somehow a very original creation, but from issue number two sure doesn’t make that easy. It screams Wolverine and Hulk from almost every panel. Hmmmm….Hulk maybe, but only in looks, his powers are wildly different. How did you get wolverine though Jeff? It’s the claws. An awful lot of Image characters have long, sharp claws that they use at the drop of a hat to disembowel their foes. That’ll always be a Wolverine hallmark to me and Pitt does it at least once in this issue. No, they’re not retractable adamantium, but anything with long claws/talons like that from around that time period instantly reeks of the little guy. As for the Hulk, it’s not just looks. He shrugs off damage, has incredibly overwrought musculature, and leaps around to get from place to place. Backstory and other powers are very different, of course, but the rest … there must be some massive gamma ray bombs out there in his past somewhere, that’s all I’m sayin’. The number one reason I like Pitt is the story line, and I agree with you somewhat about the Hulk/Wolverine ripoff since I’ve heard the arguements, but I think the reader should be willing to overlook these facts and concentrate on the storyline. In your earlier post, you mentioned that you didn’t know much about Pitt, so I’ll give you a little bid of info. Pitt comes from planet Creed, we dont know much about him before he comes to Earth but apperently he has a dark past, as bounty hunters are chasing him. When he comes to Earth he saves Timmy(pictured in your illustration) and Timmy’s grandfather from a subway car full of thugs.You later learn that Timmy and Pitt are brothers. I won’t go past this but I think you get the basic plot. See what I mean about the originality of the story line? These events make for some wicked battle scenes in an alternate reality. A certain hocky stick/talon/demon duel on a Hockey rink comes to mind, these crazy fights and plots are what makes Pitt so special to me. Here is the visual difference between Pitt and Marvel’s Hulk and Wolverine. Wolverine’s claws are a LOT simpler than Pitt’s. Wolverine’s claws are always aligned, but Pitt’s claws are not as they are attached to his fingers. The fingers of Pitt can be very complex while being Pitt is hit or he has hit something. Given the same about of money, any artist would have picked to draw wolverine over pitt. A lot of the claws on image characters are fairly more complex than wolverines. Now while Hulk and Pitt may have similar body types, their faces are different – as people could tell the difference between teammates Lyoto Machida and Anderson Silva by facial structure alone (yeah, the skin colour is different too). Yet still, Pitt and Hulk have different faces. They have different noses from each other. Their veins and scars are different as well as their abs. Because of their fighting style and weapons, Pitt and Hulk hardly ever strike the same way – and the method of striking is also different from Wolverine as I have already mentioned. Pitt also sustains damage differently from Hulk. Overall, the artist of Pitt had changed his concept of a big monster by many degree than he should had. He really changed as an artists for Pitt. I’ll say that Todd Mcfarlane changed the least though Spider-man and Spawn may seem less a like than Pitt/Hulk. The techniques of Mcfarlane are what matter and they changed little. 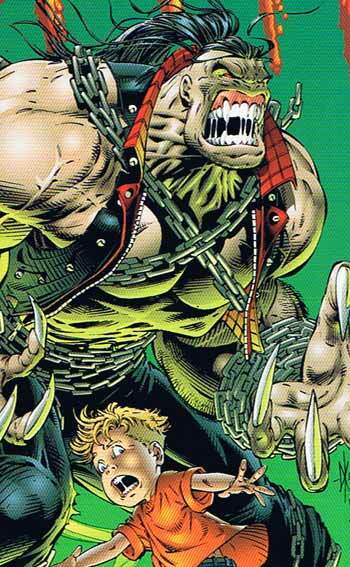 Looks more like a Lobo rip-off with the leather clothes, than Wolverine or a shirt-free Hulk.